The roofs of a cattle byre (luak) and huts are just visible above a herd of tethered cattle at a camp, with a youth with hands on hip partially visible in the foreground. 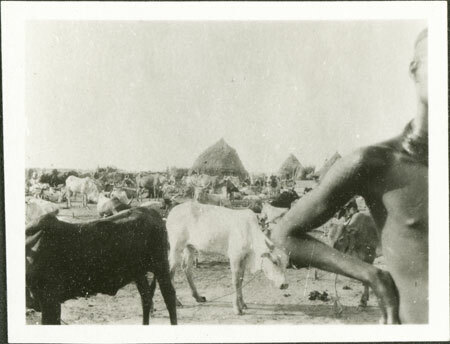 This image is part of a film dealing with Nuer camps on the Nyanding River area where Evans-Pritchard carried out fieldwork for a short period in 1931. This area was occupied by Jimac and Gaaliek secondary sections of the Mor primary section of the Lou. Note on print reverse ms pencil - "3 114 "
Morton, Chris. "Nuer cattle camp" Southern Sudan Project (in development). 03 Jan. 2006. Pitt Rivers Museum. <http://southernsudan.prm.ox.ac.uk/details/1998.346.114.2/>.